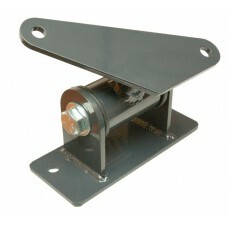 Replace your factory Nissan Hardbody (D21) rubber motor mounts with something drastically more robust! These heavy duty Nissan Hardbody (D21) motor mounts for your Nissan Hardbody (D21) pickup won't split in half at the rubber like factory ones will. These motor mounts hold up to the extreme rigors of off road trail riding and rock crawling. Fits: Nissan Hardbody 1986, 1987, 1988, 1989, 1990, 1991, 1992, 1993, 1994, 1995, 1996, 1997 The Rugged Rocks 1987 - 1997 Nissan Hardbody heavy duty replacement motor mount uses a Polyurethane bushi..